As a direct response copywriter, my mission is to help clients maximize revenue by providing the highest level of direct response copywriting. I will provide services punctually, on deadline. I will be professional and responsive. I will also communicate frequently. 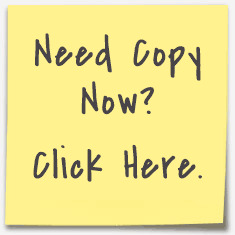 The purpose of copy is to SELL products and services, not win awards or kudos. The ONLY expert is the customer or client who will buy what you’re selling. That’s why testing is VITAL to your success. Opinions about copy are just that – opinions. Testing data drives copy. Sell with integrity. Tell the truth about the product while stressing benefits … disclose the limitations. And always include a rock-solid guarantee. You may lose some sales in the short term but honesty will lead to more sales on the back end. I’m here to help you reach your business and personal goals. I believe in the power of direct response copywriting to ramp up sales and build profitable and super-valuable businesses.